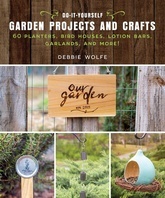 Improve your garden and home with 60 easy projects! Create your dream garden with simple bird baths, herb drying racks, and unique planters. You can also bring the outdoors inside with natural fabric dyes, pressed flower papers, herbal bouquets and more. DIY Garden Projects and Crafts relies on home grown and foraged materials that will inspire creativity and capture the bounty of the seasons. The sixty practical and decorative projects for use in the garden and home include: a gardener's tool apron, metal garden charms, a veggie market tote, a macrame produce bag, a gourd bird feeder, a kirigami leather hanging planter, Shibori dyed fabric, herbal lotion bars, gardener’s hand scrub, all-purpose thyme cleaner, and many more!